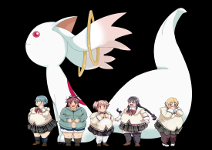 My name is Erik and I like Madoka Magica. I'm just here because I want to talk to people. I have a deviant art account, going by the name of Zenkai97, please check it out if you can. I also write fan fiction. You must be equach from FanFiction. Just glanced at your dA account. Thanks for joining. Your welcome and yes I am equach from Fanfiction. Wanna just chat for now? Sure. Right now, my mind is mostly on the Cibus project, but you're welcome to bring up whatever's on yours. Will check your dA page more in depth later, btw. I'll private message you about this. I see, well it's nice to meet you too SockPuppet. Hello! Welcome to the forum =) It's nice to meet 'cha! Do you have a favorite PMMM character? Also, if you feel comfortable with it, I hope you share some of your fanfiction here with us! I hope you enjoy your time here :D If you ever have any questions, please feel free to ask at any time! I really like Kyoko and I kind of like the main characters too. I did shared one of my fics on the fan fic rec called Madoka meets Horror.